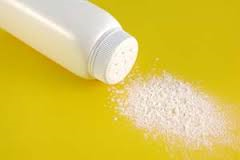 Talcum powder is made from talc, a mineral that is composed of magnesium and silicon that is mined from the earth. It’s similar to asbestos. Talcum powder (talc) is widely used in adult body and facial powders. One of the most popular forms of talcum powder is baby powder, a product made by Johnson & Johnson (J&J). J&J specifically advertised for its product to be used by women for genital hygiene care, even though they knew there was a risk of ovarian cancer with use in the genital area. J&J withheld this knowledge from women and gave them no warning. In 2013, a lawyer representing the company admitted that the company’s executives were aware of the talcum powder- ovarian cancer risk for decades, yet refused and failed to provide ovarian cancer warning label to its product labels to protect women. Were profits placed over the health and safety of women? You know the answer to that. J&J should be held accountable and responsible. If you, or a deceased loved one, have been diagnosed with ovarian cancer and used Talc, contact us today to see if you are entitled to compensation. Time may be running out so it is important to contact us today. We are here to help. 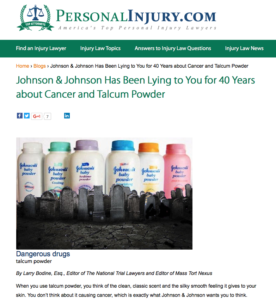 Writing in PersonalInjury.com, Larry Bodine, Esq., Editor of The National Trial Lawyers and Editor of Mass Tort Nexus says that “shocking court records reveal that Johnson & Johnson has known for 40 years about the link between talcum powder and ovarian cancer, but it has never bothered to warn consumers who use its Baby Powder and Shower to Shower Powder. “The truth came out on May 2 when jurors blasted the cosmetics company with a $55 million verdict for hiding the cancer connection, distorting research about the talcum-cancer connection and lying to the public. The damage recovery went to Gloria Ristesund of Sioux Falls, SD, who was diagnosed with cancer in 2011 after using J&J’s talc-based feminine hygiene products for four decades. “Another jury in the same courthouse awarded $72 million on February 22 to the family of Jacqueline Fox of Birmingham, AL, who used Johnson’s baby powder for 35 years. She was diagnosed with ovarian cancer in 2013 and died last year. “For decades, according to the plaintiffs, J&J and its lobby the Talc Interested Party Task Force (TIPTF) distorted scientific papers to prevent talc from being classified as a carcinogen. Stories like these point up the cancer risk for women who use talc. So if you or a deceased loved one used talc and were diagnosed with ovarian cancer, contact us today to see if you are entitled to compensation. Help us hold Johnson & Johnson accountable.